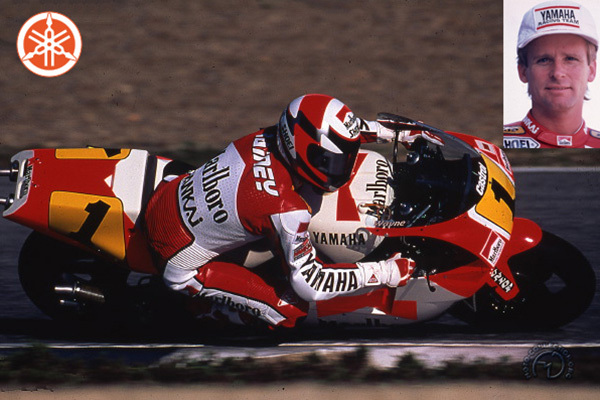 In 1991, the Australian Wayne Rainey tookthe world championship for the second consecutive time in the flagship 500cc class, riding a 500 Yamaha from the Kenny Roberts team. He won the title after a bitterly fought truggle with the Honda of his fellow Aussie, Michael Doohan - one of the tour's most promising new riders - and the Suzuki of the brilliant but erratic American Schwantz. With bikes as with cars, Grand Prix riders live at the limit, constantly striving to achieve perfection in their pursuit of victory. The talented and daring Rainey is one of the most dedicated two-wheeled GP aces, a skillful rider who knows how to make the most of his opportunities. Rainey finished the 1990 season with seven wins out of 15 races. In 1991, with only six victories under his belt, he spent the tail-end of the season in a hospital with a fractured femur after a crash while practicing for the Malaysian Grand Prix on the Shah Alam circuit. 190mph clash of wildmen astride 160 horsepower, firebreathing terror cycles, stabbing at the envelope of thrills and danger. But the sheer cost of taking part in GPs is threatening the circuit's existence. A privately entered Yamaha can cost its rider something like $175,000 before he even starts racing. The enormous expense of a season's racing and the difficulty of finding sponsors limit fields to about 15 riders per race. Constantly hanging it out over the edge, Wayne Rainey demonstrates an enviable mixture of Aussie daring and consummate racing skill.